There is no better way to experience the professional world of soccer than being part of that element one-on-one. Audiences and youth players might see the final product – the games, the goals, the bright lights and eventual trophy raising – but don’t necessarily have a sense of what it takes to get to that level. 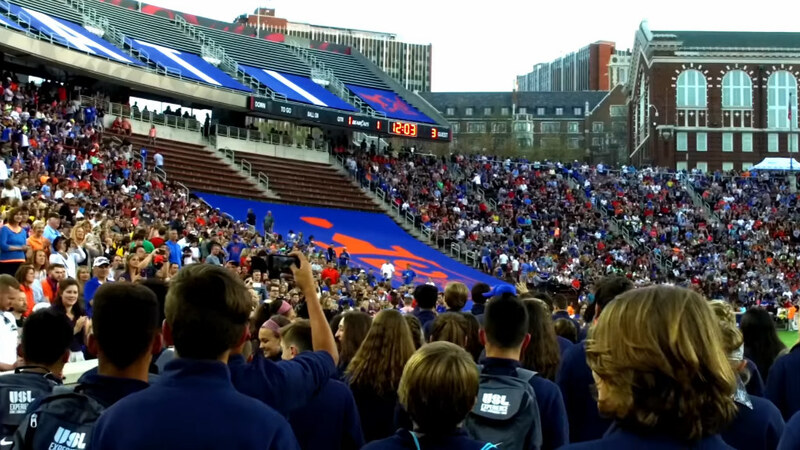 Thanks to an incredibly successful USL Experience event, hosted this year by FC Cincinnati and culminating with being a part of a USL-record crowd of 20,497, an elite group of 70 Super Y League players earned the opportunity to get a taste of the pro lifestyle and the work to get there. As players made their way from all parts of North America into Cincinnati, one of their first experiences was the realm of being in the spotlight. Last Thursday’s Media Day included a photo shoot, giving participants the chance to show their personalities and photogenic traits. Having some quality on the soccer ball also was a prerequisite. Another media-driven element of being a professional – interviews. Players went in front of the camera post-game to give their thoughts about matches, training and the overall experience. The players had a fabulous venue to train on at Nippert Stadium, providing a high-level platform that is FIFA-certified to showcase their skills. Their every move was also on display in front of scouts, including the U.S. Soccer Federation, as participants looked to make a significant impact as they work toward a bright future in the collegiate, professional and international realms. USL Experience players had an in-depth look at the Nippert Stadium facilities, had lunch together at the stadium, met FC Cincinnati staff, including U.S. Soccer legend and FC Cincinnati Head Coach John Harkes, FC Cincinnati players and had an opportunity to watch the expansion USL franchise train, just to touch upon a few of the noteworthy professional lifestyle moments. Harkes also spoke with players about the demands and sacrifice to make it to the pro level. Coming from a National Soccer Hall of Famer who has experienced the game at the top levels domestically and abroad certainly had an impact. Showcasing another facet of the professional game, USL Experience players had the privilege to listen to Louisville City FC President Amanda Duffy and FC Cincinnati CFO Sarah Huber – two former players who are now integral members of their respective USL franchises. After all of their work on the pitch wrapped up, the USL Experience players were recognized at halftime of FC Cincinnati’s match against Louisville City FC. If they wanted a taste of a world-class and professional atmosphere, it couldn’t have been better as a rousing USL-record crowd of 20,497 was in attendance at Nippert Stadium, the same venue they played in earlier in the week.